This book is intended to address a large and growing global health challenge-the health of migrant people around the world. It was written with the belief that the global health community can decrease the substantial health disparities that exist between migrant and nonmigrant populations by recognizing the unique needs of migrant populations and using the right tools to understand and improve their health. The primary goal of the book is to summarize in one reference the many methods available for health research on migrant populations and to address the unique issues involved in conducting research on health among migrants. Our focus in the book is on health outcomes, although the methods are applicable to other outcomes (e.g., economic, environmental, social). A secondary goal of the book is to increase attention to the health disparities and lack of health services available to migrants. Ultimately, we hope that the methods learned and applied will be used in research and public health programs to improve the health and quality of life of migrants around the world. Existing books on global and public health generally have very little or no discussion of the association between human migration and health; or if they do consider the topic, their review is often limited to a narrow focus, such as the migration of health care workers. Similarly, books on specific diseases and health outcomes (e.g., tuberculosis, AIDS) generally address migration, if it is considered at all, as a cofactor in disease transmission risk and not as a characteristic defining a population at risk for multiple diseases. We believe that if we are to conduct valid research and develop effective intervention programs, migrants need to be viewed as a vulnerable population at risk for multiple diseases and a population needing unique approaches. This would make migrants similar to other vulnerable populations such as certain ethnic groups, women, children, and the elderly. The largest numbers of international migrants move from developing to developed countries, but a surprisingly large number (over 40%) migrate from one developing to another developing country. Geographically, migration from developing to developed countries is often realized as south-to-north migration and migration from one developing country to another is seen in south-to-south migration. Women represent almost half of global migrants. This is a marked change from a few years ago, when they were a distinct minority of global migrants. The number of internal migrants (those who move from one region within a country to another region within the same country) dwarfs the global total of transnational migrants. The United Nations estimated that in 2010 there were 740 million internal migrants in the world (UNDP 2009); this number includes mostly internally displaced people and rural-to-urban migration. The number of internal migrants in China alone is nearly as large as the total number of international migrants in the world, and this trend of rural-to-urban internal migration shows no signs of slowing. Since many of the health and health care delivery issues affecting internal migrants are similar to those facing international migrants, and since there are similar considerations in studying these populations, they are considered together in this book. Addressing migrant health, therefore, is not an academic exercise affecting a small number of people in the US and around the world. The percentage of the total US population that are immigrants is now approaching 13%, with eight states having over 15% of their population born outside of the country (US Department of Commerce 2010). California leads the nation in this regard, with 27.2% of its population foreign-born. The percentage of international migrants is expected to continue to increase as a greater percentage of population growth is made up of immigrants. Already some states are showing a 100-200% increase in their immigrant populations. In addition, there is a shift of immigrant populations from the traditional high immigrant states (California, New York, Texas, Florida, Illinois, and New Jersey) to other parts of the country. Around the world the percentages of immigrants in some countries and regions far eclipse the percentages seen in the US. In the Middle East, for example, the percentage of foreign-born people ranges from 27.8% in Saudi Arabia to 40.4% in Israel to a high of 86.5% in Qatar (Koser et al. 2010). We envision this book achieving these broad goals by reaching several different audiences. First, it is intended for academic researchers at universities around the world, who may be in public health or medical schools or in other disciplines. In the health sciences such researchers would most commonly be located in epidemiology or community health departments, but multiple other health-related departments could have a focus on migration and health research. For example, health policy and management and environmental science researchers may consider migrants as one focus of their research. Beyond the health sciences, there are diverse nonmedical departments and research institutions for which migration and health is a subject of research. Relevant disciplines include but are not limited to administration, anthropology, economics, education, ethnic studies, environmental science, law, political science, psychology, and sociology. Another important audience for this book is public health practitioners in local, state, national, and international agencies and organizations. This includes policy analysts and staffers in these agencies and organizations. This group would benefit from a better understanding of the methods described in the book, either to conduct their own research or to understand the work of others. Whether for simple prevalence surveys or for evaluation of targeted intervention programs among immigrant populations, the approaches used by public health practitioners would benefit from understanding the crosscutting language, culture, legal, and psychological issues affecting migrant populations. Students at all levels of secondary and postgraduate education will also benefit from this book. It is current students who will have the challenge, indeed the necessity, of addressing a world where immigrants comprise an increasingly larger and growing percentage of the population. Sensitizing them to this reality now and providing tools to study and improve the health of migrants will help direct their career paths to situations in which this can be accomplished. We have divided the book into four sections. 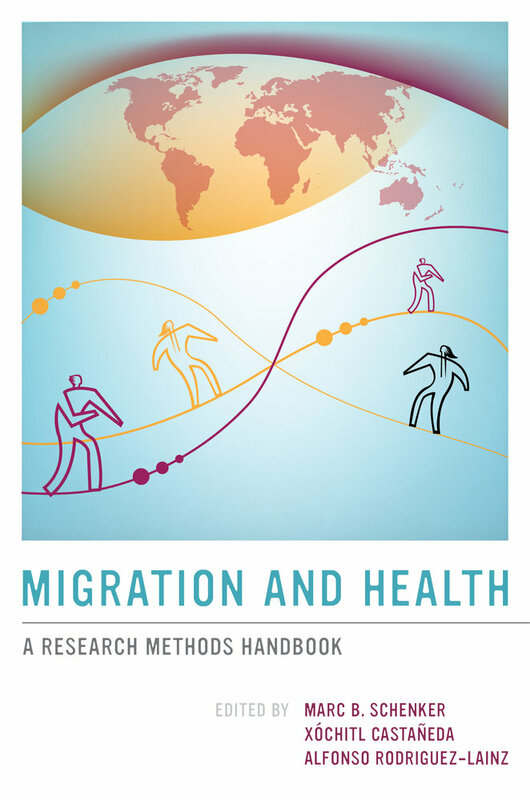 The first section includes overview chapters and advances a conceptual model for migration and health research. Other sections address quantitative methods (section 2), qualitative methods (section 3) and crosscutting issues (section 4). While we recognize that most people work in a single discipline (e.g., epidemiology, sociology), we nevertheless strongly believe that understanding the health status and factors affecting health among immigrants requires both quantitative and qualitative approaches. In addition, unique vulnerabilities and limitations of migrant populations, such as language and legal status, apply to all research and programmatic interventions conducted among immigrants. Quantitative methods such as classic epidemiological study designs (e.g., cross-sectional, case-control, and cohort designs) are most appropriate for estimating disease or risk factor prevalences, or for modeling associations of disease and risk factors. However, the nature of immigrant populations (mobile, lack of sampling frame, low education levels) makes it more challenging to conduct classic epidemiological studies. Because migration is a process of movement between two locations (often two countries), studies conducted in only one location (e.g., country of origin or receiving country) by definition limit the conclusions possible. The dynamic and selective nature of migration, such as nonrandom selection of who migrates and who returns to the place of origin, further limits conclusions possible from studies done in one location. Limited follow-up also compounds the challenges of conducting quantitative research. It is likely, too, that the most vulnerable migrants, for example, the undocumented, will be harder to reach or will decline participation in research studies. The difficulty and expense in conducting longitudinal studies among migrant populations limits these studies among this hard-to-reach population. Easier and less expensive cross-sectional studies are more common, but have the inherent limitation of no temporality and difficulty in allowing interpretation of cause-effect associations. This is particularly significant when population selection may occur at many stages in the migration process. Despite these challenges, we believe that the research community should not avoid epidemiological studies of migrants but rather should use alternative and creative quantitative approaches to study health in this vulnerable population. Put another way, the perfect (study) should not be the enemy of the good, particularly when the need for studies and programs to improve the health of immigrants is so critical. In section 2 we present chapters on classic epidemiological study designs and their use to understand health among immigrants, and we also provide some less common methods that are appropriate for studying immigrant populations. Some of these less common methods are actually used more frequently by demographers and other researchers who focus on hard-to-reach populations. For example, the chapters on respondent-driven sampling, time-space sampling, and prior enumeration address methods that are not commonly used by epidemiologists, but are useful for conducting research among harder-to-reach migrant populations. The purpose of section 3 is to give an overview of how qualitative methodological approaches can be used to study the intersection of migration and health. More specifically, it addresses how qualitative research is employed in many different academic disciplines, traditionally in the social sciences, and how these approaches can complement and enrich findings from other disciplines. In the field of migration and health, using qualitative instruments (such as key informant interviews, focus group discussion, photo voice, etc. ), researchers aim to form an in-depth understanding of migrant human behavior and the variables that govern such behavior. Because immigrant populations often come from different cultures, standard epidemiological methods and instruments may miss important behaviors and exposures not seen in the dominant culture. For example, dietary practices, alternative medicines, and cultural beliefs may not be addressed in standard survey instruments. Section 4, on crosscutting issues in migrant health research, addresses some of the common, and critically important, themes that should be considered in studies among immigrant populations. For example, migration is almost always associated with a change in the dominant language. In this context it is important to recognize that people who are not fluent in the dominant language need to be included in research, as they may be the population most in need. Traditional epidemiological studies tend to focus on the dominant population and exclude smaller groups that may differ in language ability or other characteristics. An associated challenge is that many immigrants have low educational levels and may not be able to understand or complete study instruments. Once again, the goal is to create study instruments that are more inclusive. Another crosscutting issue is immigrant legal status. This sensitive topic must be handled carefully to avoid causing harm to the immigrants participating. It should also be recognized that undocumented migrants may have the most need of health services, but also may be reluctant to participate in any research. A closely related topic is research on political refugees. At a minimum, all research must be approved by the appropriate institutional review boards to protect the study subjects. International migration research should ideally be done in the countries of origin and the receiving countries. This raises many crosscutting issues relevant to conducting research in foreign communities or binational research. We consider the methods to achieve host government acceptance for such research to be just as important as the research methods themselves. Indeed, without the appropriate approvals and acceptance, the research cannot be completed. This crosscutting issue is addressed in the chapters on working internationally and on binational collaborative research. The largest cause of migration in the world today, both internal and international, is economic disparity. Lack of job opportunities in developing countries and low salaries for those that do have jobs constitute the major impetus for people moving from rural to urban areas, and from developing to developed countries. Closely related to this economic disparity are the low birth rates and aging populations in developed countries, in contrast to higher birth rates and younger populations in developing countries. Family reunification is another important cause of migration to some countries, like the United States. A very different global cause of migration, requiring different expertise, is environmental-associated change. Acute natural disasters (e.g., earthquakes and floods) as well as chronic environmental pressures associated with global climate change (e.g., rising sea level and droughts) are forcing an increasing number of people around the world to move from their homelands. While the environmental causes of migration are generally different from the economic disparities, the human impacts on health are often the same, and research methods are similar. Finally, forced migration due to conflicts and to political and other types of persecution (e.g., refugees and asylum seekers) are a constant reality, if not an increasing one, around the world. Understanding the cause of political migration and developing effective solutions raises many questions requiring an understanding, including having a firm legal foundation in the receiving country's regulations. While understanding these different causes of migration requires very different expertise, the methods to study health outcomes in these different populations are quite similar. In addition, crosscutting issues such as language and legal status apply, at different levels, to all immigrant populations. Ultimately the improvement in health of migrant populations requires multidisciplinary solutions, whether the people are in refugee camps or settled into established communities in developed countries. This is a methodology book and as such it does not go into detail on specific health problems associated with migration. However, it is worth pointing out here that there is a very large range of health issues caused or exacerbated by migration, and that the injuries and illnesses caused by migration are independent of reductions in health services commonly received by immigrants. Further, for this book we use the International Organization of Migration (IOM) definition of migration health, that is, the health of migrants and how migration affects people in countries of origin, transit, and destination, as well as how migration affects the offspring of migrants (IOM 2011). Given the breadth of populations and factors affecting health among migrants in their countries of origin and destination, a variety of approaches are needed to understand the complex web of causation among factors affecting the health of immigrants. It should also be recognized that many health outcomes are better among migrants than among the native population, the so-called healthy migrant paradox. A primary consideration is an understanding of the conceptual models of migration and health. These models, discussed in chapter 3, set the frame for understanding the unique factors affecting health among immigrants. Foremost among these is a recognition that factors in the country and community of origin, in transit, and in the receiving country may all affect the health of immigrant populations. To focus exclusively on the conditions in the receiving country is a serious mistake that can lead to faulty conclusions or ineffective programs to improve the health of migrants. It should also be recognized that immigrants have some health advantages after immigration, although some of these advantages decline with increased time since migration (Franzini et al. 2001; Fennelly 2007). A secondary consideration is to recognize that adverse health outcomes among immigrants cover the spectrum from acute infectious diseases and traumatic injuries to chronic diseases such as asthma, heart disease, and cancer. No longer is the focus on migrant health limited to infectious diseases that could, in theory, be stopped by screening and quarantine of new immigrants. The magnitude and speed of global movement has rendered that approach ineffective for preventing disease transmission, as was demonstrated by the global spread of SARS and the H1N1 influenza epidemic. Understanding the causes of the increase in chronic diseases among migrants with longer duration of stay in the host country requires careful etiologic studies, ideally involving the populations in both the countries of origin and those receiving. For example, the increase in asthma prevalence among Latino immigrants to the US may be related to some combination of factors including neonatal or childhood exposures in the country of origin, and/or diet, medication, occupational, or environmental factors in the receiving country. Underlying genetic and epigenetic factors may further influence the disease's occurrence, as can stress and health-related behaviors such as cigarette smoking. Similar situations exist for other chronic diseases. A third theme is that immigration-associated effects on health occur over the life span and may have a different influence at different points in the immigration cycle. Thus, childhood exposures in the country of origin may have an important influence on health outcomes in the host country. Gene-environment interactions and epigenetic factors may also reflect exposures at different points in the immigration cycle. In addition, behaviors of the parents may be significant in shaping health outcomes among immigrant children. A fundamental consideration that underlies this book is that multidisciplinary approaches are appropriate, indeed necessary, for understanding the causes of poorer health for some conditions among immigrants and for developing effective solutions to reduce the disparities in health and health care between immigrant and nonimmigrant populations. Multidisciplinary methods are necessary because of the complex factors that drive migration as well as the equally complex factors that cause the disparities that negatively impact the health of migrant populations (Koser et al. 2010). The ultimate goal of this book, then, is to improve the health of migrant populations around the world. We believe that too little quality research has been done on health among immigrants, and this has in turn reduced the resources and efforts to improve their health. This situation has occurred in part because migrants have not been recognized as a large population with unique health needs, and in part because it is more difficult to study migrants than the dominant, nonmigrant population. Migrants are, by definition, mobile. They often don't speak the dominant language and education levels may be low. Legal fears may further inhibit participation in any research. Despite these challenges we know that such research is possible, and indeed it can and should form the basis for efforts to improve the health of individuals with some of the greatest need in the population. It is time for a new paradigm in addressing the health of immigrants (WHO 2010). Instead of the old isolation mentality, in which countries thought they could protect their native populations by excluding or quarantining immigrants, we need new, multinational, inclusive approaches that recognize the reality of modern human mobility and disease epidemiology. The health of immigrant populations should be monitored, and health care systems need to be sensitive to the needs of migrants. Policy-legal frameworks should protect the rights of migrants to health, including equal access to health care. By developing such systems, and conducting research on disease causation and prevention among migrants, we can truly achieve better health for all. We are not so naïve as to be unaware that this must be done in the context of a political environment that is often "anti-immigrant." However, diseases don't recognize national boundaries and modern public health should not, either. In the words of former secretary general of the United Nations Kofi Annan, "We now understand better than ever that migration is not a zero-sum game. In the best cases, it benefits the receiving country, the country of origin and migrants themselves." Fennelly, K. 2007. "The 'Healthy Migrant' Effect." Minnesota Medicine 90(3):51-53. Franzini, L., J. C. Ribble, and A. M. Keddie. 2001. "Understanding the Hispanic Paradox." Ethnicity and Disease 11(3):496-518.
International Organization on Migration (IOM). 2011. Migration for the Benefit of All. Accessed July 30, 2012. http://www.iom.int/jahia/Jahia/about-migration/facts-and-figures/lang/en. Koser, Khalid, and Frank Laczko, eds. 2010. World Migration Report 2010-The Future of Migration: Building Capacities for Change. Geneva: International Organization for Migration (IOM). United Nations Development Program (UNDP). 2009. "Human Development Report 2009-Overcoming Barriers: Human Mobility and Development." Accessed December 22, 2012. http://hdr.undp.org/en/media/HDR_2009_EN_Complete.pdf. United States Department of Commerce. 2010. US Census. Accessed July 30, 2012. http://www.census.gov/population/foreign/. World Health Organization (WHO). 2010. Health of Migrants: The Way Forward-Report of a Global Consultation, Madrid, Spain, 3-5 March 2010. Accessed July 30, 2012. http://www.who.int/hac/events/3_5march2010/en/. The study of migrant populations poses unique challenges owing to the mobility of these groups, which may be further complicated by cultural, educational, and linguistic diversity as well as the legal status of their members. These barriers limit the usefulness of both traditional survey sampling methods and routine public health surveillance systems. Since nearly 1 in 7 people in the world is a migrant, appropriate methodological approaches must be designed and implemented to capture health data from populations. This effort is particularly important because migrant populations, in comparison to other populations, typically suffer disparities related to limited access to health care, greater exposure to infectious diseases, more occupational injuries, and fewer positive outcomes for mental health and other health conditions. This path-breaking handbook is the first to engage with the many unique issues that arise in the study of migrant communities. It offers a comprehensive description of quantitative and qualitative methodologies useful in work with migrant populations. By providing information and practical tools, the editors fill existing gaps in research methods and enhance opportunities to address the health and social disparities migrant populations face in the United States and around the world. Marc Schenker is Associate Vice Provost for Outreach and Engagement in the office of University Outreach and International Programs (since July 2012) and Professor of Public Health Sciences and Medicine, UC Davis. He is founding director of the Migration and Health Research Center, Western Center for Agricultural Health and Safety, and program director for Public Health Sciences at the Center for Occupational and Environmental Health. He is codirector of the Migration and Health Center of Expertise, University of California Global Health Institute. Dr. Schenker served as Department Chair of Public Health Sciences from 1995 to 2007. He provides leadership for UC Davis outreach and engagement efforts at the local, state and international level. He received his B.S. from UC Berkeley, his M.D. at UC San Francisco, and his M.P.H. from Harvard University. Dr. Schenker is Board Certified in Internal Medicine (Pulmonary Disease) and Preventive Medicine (Occupational Medicine). Before coming to UC Davis in 1983, Associate Vice Provost Schenker was Instructor of Medicine at Harvard from 1980 to 1983. Xóchitl Castañeda has been the Director of Health Initiative of the Americas at the School of Public Health, University of California Berkeley, since 2001. A medical anthropologist by training, she was educated in Guatemala and Mexico. She did a postdoctoral fellowship in reproductive health at the University of California, San Francisco. She also received postdoctoral training in social science and medicine at Harvard University and at Amsterdam University. For over seven years, she was a Professor of Public Health Sciences and a P.I. Researcher at Mexico's National Institute of Public Health, where she directed the Department of Reproductive Health. In 1999 she received the National Research Award on Social Science and Medicine. In 2010 the California Latino Legislative Caucus honored her with the National Spirit Award for her leadership in initiatives to improve the quality of life for Latino immigrants in the US. Castañeda has published over 120 manuscripts and has served as a consultant for more than 30 national and international institutions. Her vision and commitment have led to the creation of binational health programs. Under her direction HIA has coordinated for ten consecutive years the Binational Health Week, one of the largest mobilization efforts in the Americas to improve the well-being of Latin American immigrants. Through these strategies, hundreds of thousands of Latinos have received medical attention and been referred to public and private agencies to obtain services. She has been twice elected an advisor to the Institute for Mexicans Abroad (IME), for which she has served as the National Coordinator of the Health Commission in the U.S.
Alfonso Rodriguez-Lainz is a senior fellow at the Center for Disease Control and Prevention (CDC) Division of Global Migration and Quarantine. Dr. Rodriguez’s main responsibilities include acting as a liaison, coordinator, planner, and project lead for domestic migrant health activities for the Division, across the CDC and in collaboration with national and international partners. In that role he has designed, implemented, and analyzed multiple health studies targeting migrant populations in the U.S and Mexico. Prior to joining the CDC, Dr. Rodriguez was the senior epidemiologist for the California Office of Binational Border Health, California Department of Public Health. He has extensive experience in coordinating cross-border surveillance and public health projects between California, Mexico, and Latin America. Dr. Rodriguez received his Ph.D. in Epidemiology and Master's in Preventive Veterinary Medicine from the University of California at Davis, and his DVM from the School of Veterinary Medicine in Córdoba, Spain. He has coauthored many peer-reviewed publications and several border and migrant health reports. He also teaches courses on migrant health, global surveillance, and international epidemiology at San Diego State University Graduate School for Public Health.